This monograph presents new developments in multi-level decision-making theory, technique and method in both modeling and solution issues. It especially presents how a decision support system can support managers in reaching a solution to a multi-level decision problem in practice. This monograph combines decision theories, methods, algorithms and applications effectively. 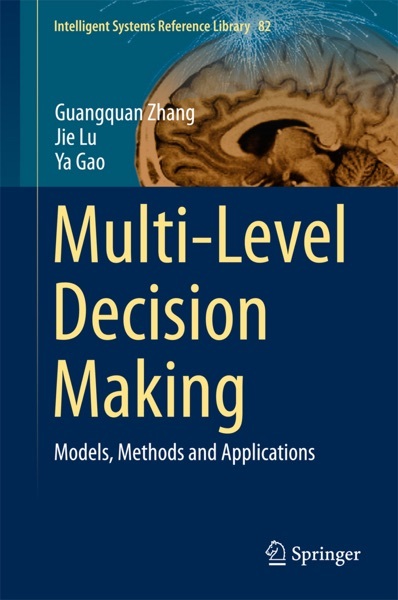 It discusses in detail the models and solution algorithms of each issue of bi-level and tri-level decision-making, such as multi-leaders, multi-followers, multi-objectives, rule-set-based, and fuzzy parameters. Potential readers include organizational managers and practicing professionals, who can use the methods and software provided to solve their real decision problems; PhD students and researchers in the areas of bi-level and multi-level decision-making and decision support systems; students at an advanced undergraduate, master’s level in information systems, business administration, or the application of computer science.